Ecocem Ireland, one of Ireland’s premier manufacturers of high performance low carbon cement, has upped its export capacity with the official opening of its second bulk import terminal, capitalising on the potential to supply the London / south east construction market. 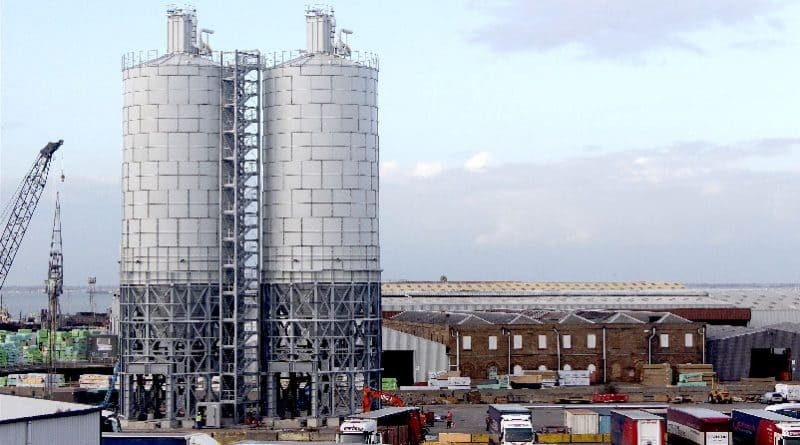 This is Ecocem Ireland’s second bulk import facility in the UK and is located in Sheerness in the Port of Medway. Ecocem Ireland are a subsidiary of Irish company Ecocem Materials, Europe’s largest independent manufacturer of high performance, low carbon cement. Ecocem Ireland opened its first bulk import facility in Runcorn in early 2016. The import terminal required an investment of £2.5 Million (approximately €2.9 Million) which will see the firm being able to supply the market with 250,000 tonnes of the low carbon cement alternative per annum. This is part of the overall Ecocem Materials Strategy to develop export markets from its existing facilities in Ireland, Holland and France. Micheál McKittrick, Managing Director of Ecocem Ireland, commented: “Our second investment into the UK in a state of the art import facility demonstrates to the market the need for the low carbon cement alternative and the growing demand from the UK construction industry. We have already engaged in long term agreements with major concrete manufacturers in the UK and will continue to build momentum in the coming months”. Ecocem’s cement is the Best Available Technology for minimising the environmental impact of concrete, whilst maximising its technical performance. This technology is used widely in Ireland and the UK in projects such as the AVIVA Stadium in Dublin and the Shard in London. As the UK seeks to reduce its carbon footprint, coal fired power stations are either being shut down or switching to biomass fuel. The challenges facing the UK steel Industry have been well publicised (strong sterling, cheap Chinese imports, etc.) and have resulted in the closing of some factories and a sharp reduction in output from others. These two factors have resulted in shortages in the supply of alternative binders to the concrete industry, increasing costs and lowering performance. The UK concrete industry have long appreciated the technical superiority of using alternatives such as GGBS, and Ecocem are now in a very strong position to service this opportunity from the facilities in Runcorn and Sheerness. Andrew Martin, Group Land & Property Directory of Peel Ports, commented “We are delighted to be working with the Ecocem team to enable and support their entry into the UK market. We have been able to provide a multi-site solution that will accelerate the delivery of product as close as possible to the areas of consumption. We wish Micheál and his team the best of success for the future. The demand for low carbon materials in Europe has never been stronger, reinforced by the historic international agreements at the recent COP 21. Ecocem’s ability to deliver a reduction of over 70% in the carbon footprint of concrete, the world’s most popular building material, means the future is bright for the Irish firm.